In conjunction with Philagrafika 2010: the Graphic Unconscious, The Athenaeum of Philadelphia, collaborating with the Philadelphia Center for the Book, presents an exhibition of contemporary book arts produced in response to Athenaeum research collections. First Person Arts (FPA) and the Bryn Mawr Film Institute (BMFI) present Warning: Graphic Content on Tuesday, March 9 at 7pm, as part of Philagrafika and One Book, One Philadelphia. This multimedia presentation explores the genre of the graphic memoir across multiple forms. Three leading artists– Daniel Heyman, Jamar Nicholas, and Josh Neufeld – will present their work and discuss how they create it. A screening of the film Persepolis, based on the graphic memoir by Marjane Satrapi, will follow the discussion. Women's Studio Workshop, in Rosendale, New York, has been publishing artists' books since 1979 and to date has produced over 180 titles. In conjunction with the exhibit at the Free Library, Book is a book is a book is a book. Or is it? 30 Years of Publishing -- A Selection of Artists' Books from Women's Studio Workshop, the founders of WSW, Ann Kalmbach and Tatana Kellner, will give a presentation on the history of WSW and the opportunities for artists there. This will be followed by a tour of the exhibit and reception. For information about WSW, visit www.wsworkshop.org. Call for entries for an exhibition of artists’ books with a story component. The theme of the exhibition is “The Story Is The Thing”. The story component of entries may be the creation of the book artist, or it may be a collaboration (for example, a writer provides the story and a book artist makes the book). 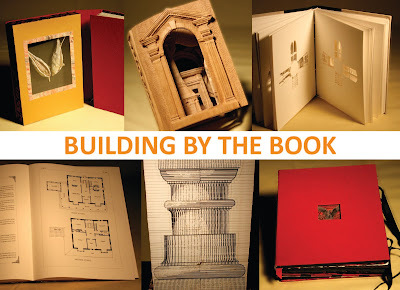 The books can be sculptural in form and can be made of materials not usually associated with books. Books can be offered for sale. More than 20 hours of meticulous paper-cutting, in creating just one map by artist/illustrator Julie Marabelle, squashed into a little more than 2 minutes of film. For address and directions click here. 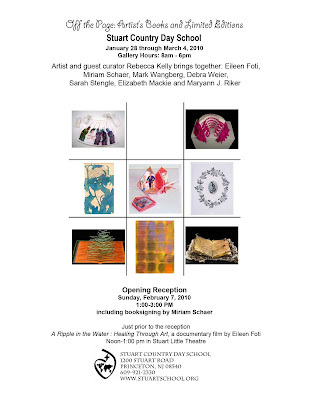 Artist and curator Rebecca Kelly brings together: Eileen Foti, Miriam Schaer, Mark Wangberg, Debra Weier, Sarah Stengle, Elizabeth Mackie, and Maryann J. Riker. The lecture is at 6:00 and the reception/silent auction is from 7-8:30. The Print and Picture Collection is currently accepting donations--a small book, drawing, print or photo that you would feel comfortable with having sold for $50--for their "affordable art" silent auction to take place that night. The bidding on everything will start at $50 or less. Hopefully bidding will go higher. And if anything isn’t sold that evening, they hope you’ll let them keep it on hand to sell for $50 in the future. Of course, all proceeds will benefit the Print and Picture Collection. Deadline for all the donations: Friday, March 5th. Please deliver your items to the Print and Picture Collection (open 9 to 5, Monday through Friday). They are planning to mount pictures of the donated work on their website www.FriendsofPIX.org. This event is a fundraiser sponsored by the Friends of the Print and Picture Collection and is held in memory of Robert F. Looney, the Free Library’s respected graphic arts curator from 1963 to 1986. 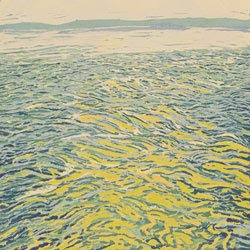 He assembled a remarkable collection of fine art prints and photographs from local as well as nationally known artists. 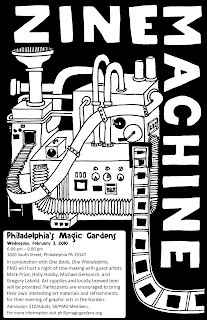 In honor of featured graphic novel Persepolis by Marjane Satrapi, PMG will host a night of zine-making, presentations by notable local zine artists, and a private viewing of the exhibition Etchings: Works on Paper by Isaiah Zagar. Art supplies and locally-brewed beer will be provided; however, participants are encouraged to bring their own interesting art materials and refreshments for their evening of graphic arts in the Garden. Guest zine-artists include Mark Price, publisher of Zine of the Month Club, Anni Altshuler and Leah Mackin of Holly Hobby, Jenni Drozdek, Michael Gerkovich and Gregory Labold. that references printmaking in dynamic, unexpected ways--join the Abington Art Center to celebrate their Solo Series, featuring Jill Allen, Cynthia Back, Bruce Campbell, and Mickie Rosen. 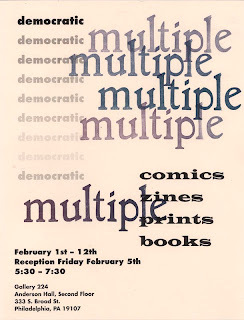 Democratic Multiples: Comics, Zines, Prints, and Books is an exhibition showcasing artists who create affordable multiples. It is curated by current MFA Book Arts students, Lara Henderson and Mandy Dunn.